This version has been curated and unit checked by Penny Noble and is known to run into COR and PCEnv. This variant is parameterised for the BASIC model, excluding acetylcholine dependent modulation and electromechanical processes. This model is also associated with a PCEnv session file. ABSTRACT: The guinea-pig ventricular cell model, originally developed by Noble et al in 1991, has been greatly extended to include accumulation and depletion of calcium in a diadic space between the sarcolemma and the sarcoplasmic reticulum where, according to contempory understanding, the majority of calcium-induced calcium release is triggered. The calcium in this space is also assumed to play the major role in calcium-induced inactivation of the calcium current. Delayed potassium current equations have been developed to include the rapid (IKr) and slow (IKs) components of the delayed rectifier current based on the data of of Heath and Terrar, along with data from Sanguinetti and Jurkiewicz. Length- and tension-dependent changes in mechanical and electrophysiological processes have been incorporated as described recently by Kohl et al. 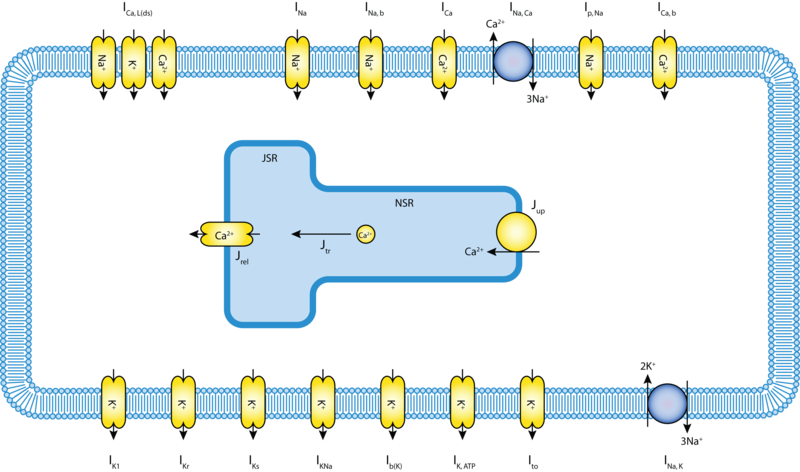 Drug receptor interactions have started to be developed, using the sodium channel as the first target. The new model has been tested against experimental data on action potential clamp, and on force-interval and duration-interval relations; it has been found to reliably reproduce experimental observations. Derived from workspace Noble, Varghese, Kohl, Noble, 1998 at changeset 995dda261096.